Whether this inspires you or irritates you is your choosing. 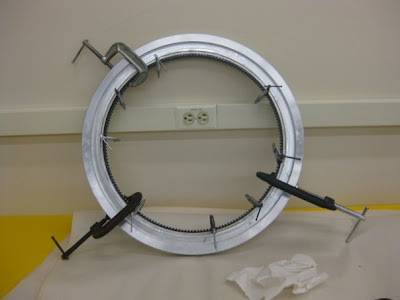 A group of nine mechanical engineering students from Yale University leaked pictures of a spokeless wheel design onto the internet for all of us to see. Thank you, Gentlemen. And thank you Bicycle Design for the tip-off on Twitter. The bicycle as you see here is a single speed setup. Because of the lack of the traditional spokes and hub, the boys had to find a way to transmit pedal power to the rear wheel. 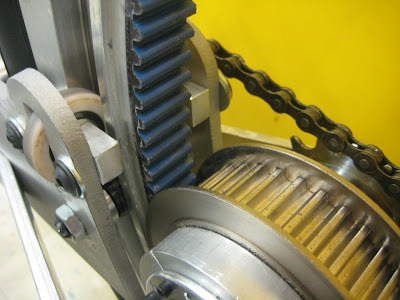 Which they did by dividing the gearing into two stages - a 53-13 combo, output to right side crank, from where another 53-13 sprocket combination yields final output to wheel. It also looks like the output hub mates with a toothed profile on the inside curve of the wheel similar to what you would see in a timing belt. 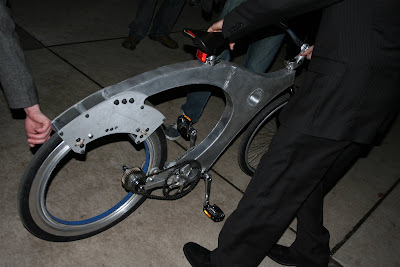 What they also found out was that the cost to produce a single wheel was huge, so they decided to just make one spokeless rear wheel to see if it'll work. The wheel is made out of 6061 Al alloy, which is cheaper compared to the aerospace version 7075. 6061 has a density of 2.70 g/cc, an ultimate strength of 310 MPa and a yield of 276 Mpa, showing about 12% strain at rupture. If I draw a stress-strain diagram of this stuff, the area under the curve is somewhere around 30-35 Joule/cu.m. Multiply that with the thickness of material used and you get it's energy absorption at rupture per unit width, in Joules/sq.m. By the way, this basic calculation is really handy if you want to make bicycle fenders and chain guards! Having been through an engineering school already (phew), I think I may be qualified to speak on what exactly the driver might be behind this work. This bicycle design is very likely for an engineering design class, either the initial MENG 185 - Mechanical Design, or the MENG 471/472 Senior Level Engineering Design Course. There, students form groups of 3-4 (or more) and under the guidance of an advisor will seek to realize a design idea. That may either be for an innovative new product or something which may offer genuine improvements to an existing product. Some great ideas that can be made may even be granted patent towards the engineering department. Other ideas don't make the cut for patents but nevertheless, all these students will receive 4-5 credits for the class so they pass and get a mechanical engineering degree. That said, what would still be interesting is to learn the rationale behind choosing a spokeless wheel to work on for a project. Just for being cool or something else? The bicycle is near a state of perfection and like we always yell again and again, the more you try and fiddle with what exists, the more you sacrifice what's already there in terms of design trade-offs. I suppose that's the thing with design. It's tricky. Gain some, lose some. Gain-gain is rare. 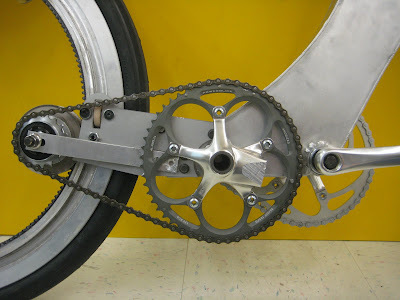 What's better in terms of taking loads, transmitting motion, and reducing friction - spokes, ball bearings and an axle or a two extra cranks, chains, and a timing-belt kind of setup? Spokeless wheels for bicycles aren't anything new. Most folks who think of this idea have always maintained the inconvenience of the occasional tensioning of spokes in prior art as a reason for going spokeless. What that entails is a new system from them with more complexity, more moving parts, more weight and more friction. That's not much improvement. What I would have done if I were them would be to visit the nearest patent office to see what was done by individuals in the years past in spokeless wheel design. Were they successful? Did the idea SELL? Did it actually make someone's life better? Perhaps spokeless wheels would be better for wheelchairs because that way an operator's hand wouldn't be at risk of going in between spokes? Just my two cents. Good work anyway guys! "A" grade for now.